A collection of blue embroidered sponges. Embroidered skiers in grey color and cabriole point finish in mascarpone colour for a modern and refined collection. Combed cotton 550g / m² or 450g / m² for the bathrobe, you will want a shower just to snuggle in your towels sponges. 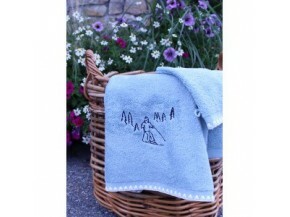 Its embroidered skier will perfectly complement the decoration of your bathroom in your chalet! Collection available in yellow for more sunshine!